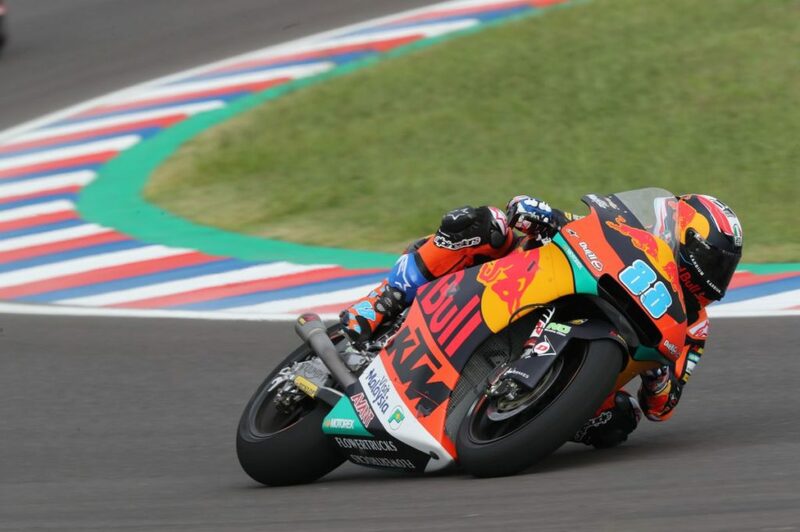 The Red Bull KTM Ajo Moto2 team experienced mixed fortunes in the second race of the 2019 season, held at Termas de Rio Hondo this weekend. Jorge Martin suffered a crash in the final part of the race when he was riding in eleventh place. In his second race as a Moto2 rider, Jorge Martin had a difficult start, conceding two places off the line to go back into 17th. The reigning Moto3 World Champion managed to recompose himself, making progress thereafter to reach 11th. Despite the good pace, the Spaniard would eventually crash out at Turn 5 with 5 laps remaining. Brad Binder is now 7th in the overall standings, with Jorge Martín 21th. The Red Bull KTM Ajo Moto2 riders will return to action from April 12-14th at Red Bull GP of The Americas, to be held in Austin, USA.